A good shift is one where the calls are steady and not too bad, and where the teams around you are good to work with. Generally speaking, all the frontline crews I meet are great but the A&E Support crews, who don’t really get a look in, are among some of the stars. I’ve met a few and have been very impressed by their knowledge, skills and the application of their work. I worked this shift with an A&E Support crew shadowing me on calls... well not deliberately, they just happened to be the nearest and most appropriate for the type of call I was getting. It started with a jog down to Waterloo station, where another crew was already on scene, dealing with a separate incident from mine. I was going to a ‘leg injury’. A motorcycle paramedic was already there, and a screen had been erected around the poor 58 year-old lady who’d fallen and hurt herself. I was invited to take a look at the injury and was quite startled to see a fractured knee cap and a dislocated lower leg. The patella was broken through its centre; one half had slid up the leg and the other half remained more or less in place. It was a gruesome looking injury but the lady was in no pain at all. Amazingly, this injury had occurred as the result of a spectacular slip... on a train ticket that was lying on the polished floor of the station concourse! 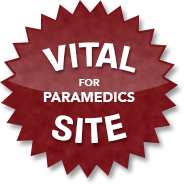 The MRU paramedic had to leave us because yet another call had come in from the station – an epileptic was having a fit not far from where we were. Three emergency calls had been taken from the same area in a 20 minute period. So, I chatted to the woman, offered her entonox for when we moved her leg, which was inevitable, and waited for the third ambulance to come and take her away. It wasn’t long before my colleagues showed up and we carefully straightened the leg. She took no pain relief because she told us she felt no pain. I could imagine someone younger and fitter screaming in agony at this point, but not this lady. When the leg straightened out, it automatically slid back into place and we were left with an aligned limb (it had been at an angle from the knee down prior to this) and a Patella with a single, unmistakable ridge across the middle. We took her on board the ambulance and she still felt okay, apart from the odd twinge. She still didn’t need any pain relief and I was very impressed by her attitude, but I knew that her knee would never be the same again and she’d probably have other associated problems to deal with throughout her life now. From one station to another; this time a tube station a few miles away from my last call. A 37 year-old man was sitting on a bench, feeling dizzy every time he got up to walk. He’d been like this all night and had tried to resolve it by eating fruit... who knows? Anyway, on his way to work, he became too dizzy to continue the journey, so here he was, waiting for me. He had a history of hypertension, so it’s possible there’s a link. He wasn’t vomiting but he did feel nauseous, so when the ambulance arrived (an A&E Support crew) he was carefully trundled out on a chair. His ECG was normal-ish and his vital signs were good, so the crew took him to hospital and I traveled behind them in the car, just in case. On the next call, for a 24 year-old man with back pain, I was sent to an office complex that was under renovation. The patient was the site carpenter but when I got on scene, I didn’t find him nailing bits of wood together, instead he was lying flat on a wallpaper pasting table. He was in agony. The man had suffered a back injury years before but had been fine since. Now, all he did was sit down and his lower bank went. He told me the pain radiated down his leg on the same side. It was possible that he’d pulled a muscle, or there was nerve involvement. A disc may have given a little. Whatever it was, he had to come off that table. I asked for, and received another A&E Support crew. I’d given the young man entonox and a dose of morphine, and his pain score had reduced. So, when the crew arrived, we got him to carefully move himself off the table. He wasn’t so unstable that he needed a spinal board, but he had to be handled with kid gloves because the smallest change in his position caused pain. By the time he’d started sitting down in the carry chair, he was complaining of nothing more than the dizziness expected after a long lie down on a table. That and the morphine, I expect. The poor guy was worried sick about the long-term effect the injury would have on him, especially as he was self-employed and relied on work with no sick-pay benefits. He told me he had a new baby at home and it concerned him that he might not be able to make ends meet. I felt a lot of sympathy for him. No patient contact with the next one but only because I went to the wrong hotel. In my defence, there are two hotels in the same little area, with the same name, apart from a minor sub-title. I’d stood in the lobby of the wrong place, ready to complain about being held up on an emergency call (an elderly woman was feeling very unwell), when the Manager informed me that they didn’t have the room number I asked for. He pointed across the road and said ‘But they do’. So, I drove ten metres to get to the correct address and the crew showed up. I became redundant at that point, so I left them to it. The same A&E Support crew came to assist with the next call of the day. It was for a 36 year-old man who worked in a hotel that is notorious for calling ambulances and then repeatedly calling back, with worsening symptoms that often don’t exist, just because they have been waiting. On this occasion, they’d called for a man with ‘abdominal pain’. That is not enough of an emergency to get an 8-minute response, so they had to wait. But, true to form, they called 999 again and added ‘difficulty in breathing’, which made the call go RED and I was asked to go and check it out. I got there to find that the man had groin pain and had no trouble breathing at all... except for the obvious breathing change that accompanies groin pain. One of his testicles was causing him discomfort and the sharp, burning pain was travelling up into his groin and lower abdomen. Although this is an unfortunate situation for any man, it still isn’t a life or death emergency, so I asked for an A&E Support crew, and I got the same call sign assigned to me that had helped me on the back pain call. Once aboard the ambulance I asked the man to drop his trousers and let me see what the problem was. Unorthodox as this may seem to you, it is quite important to visualise a point of pain, so that obvious injury can be ruled out. It’s simply a question of whether or not you have the steel to do it. Obviously, with a female the rules for me change but visual examination is still crucial wherever possible. I was looking for evidence of torsion (twisting) of the testicle, a potentially ball-losing injury. I had a quick look and I couldn’t see any evidence of unilateral enlargement. However, I was able to get the man to specify exactly where the pain originated on his testicle. He pointed to the bottom of it. He may have Epididymitis, I thought. He’d be going to hospital to have it checked out (excuse the obvious hotel-inspired pun) whatever the problem was. If he had torsion, it would have to be dealt with immediately. He’d told us his pain was 10/10, but he jumped and cried out ‘Allah!’ (he is a Muslim), when his finger was pricked for a bit of blood. People who say they have more pain than someone giving birth, and then scream when they get a little jab with a one-million gauge needle really need to get their thresholds in perspective. Once again, I left him to the crew to take away to hospital. He’d declined pain relief on the basis that more pain would be required in order for him to receive it. He was stable and in no immediate danger. So I wasn’t required any more. The crew, S and J, were happy to take over and transport him over as few bumps in the road as possible. The end of the shift consisted of me sitting in the car on Traffy Square, thinking about all the years I’d been standing by on that spot, and the people I’d worked with... and the observers I’d shared my scenery with. A young film producer had arranged to meet with me so that she could chat about how we hand patients over at hospital. She’s making a short movie and it includes a scene where ambulance paramedics lose a patient. So, I was to tell her how best that could happen in hospital. She got more than she bargained for because, just before she turned up (and I should add that I had ended my day’s duty and was heading home after the meeting), I was asked to check on an alcoholic who was lolling about on the pedestrian area, while tourist kids and their tourist teachers, passed by. He was a Romanian man; quite young and very shabby, although his photo ID depicted someone who’d been brighter, cleaner and a lot more alert than this in a previous life. He was drunk and demanding an ambulance for stomach pains. Liver pain – that was his problem. I had to put off my meeting while I dealt with him, so the producer stood by with the rest of the interested public, as I held on to him when he thrashed around and insisted on lying back down every time he was sat up. I had a Trafalgar Square security man with me – he was the one who’d asked me to help – so two of us were struggling at times to keep this guy under control. He wasn’t violent, but he slammed his head onto the ground repeatedly in an attempt to over-ride sanity. He wasn’t drunk enough to behave like that, he just wanted to. I called in for an ambulance and lost communication with Control completely when my hand-held radio died (flat bat) and my car radio didn’t want to transmit any more. Up until that moment, both were working just fine. Luckily, I got a message through to them via my own desk, CSD, and I was sent an A&E Support crew again. Not the same crew, a different one, but still very welcome. After a bit of chatting and being ignored, we got him into the ambulance (but only after he feigned collapse and put my back out). He spent all of ten minutes in there, arguing with us about his condition, which we weren’t disputing at all. Then he declared that he needed to pee, and he stood to do so inside the ambulance. I’ve seen this happen many times. He was told off in no uncertain terms by the crew, and he turned to leave. Even though we were giving him what he wanted – a lift to hospital – he still felt his need to urinate, right there and then, was much more important. He got out of the ambulance and headed towards the public toilets (we think). And that was that. He’d refused help after all the drama he’d put us through. I asked the crew to leave so that they could get home on time, rather than wait for him to return, and I spent another ten minutes on the square, telling the producer how to lose a patient in fiction-land, whilst simultaneously giving the Romanian peeing drunk a second chance to get help if he needed it. He obviously didn’t because he never returned. For those of you that are interested in a) Girls, b) Cycling and c) Travelling long distances until you destroy your knees, then please drop in on this blog. My good friend Abbi and her good friend Kirt are currently pedaling their way across France and on into Spain. They'll complete over 1,000Km and will both, I imagine, need medical attention when they get home! I'm their official 'remote medic', so on-call for them should they encounter any difficulties. And by that I mean physical injury... or French boys. I was working when this call came in. Our crews did an excellent job and were very professional about it all. Of course, inevitably, the news leaked out and it was all over Twitter, then Wikipedia, then the 'proper' news picked it up. Amy Winehouse was found dead and, apart from what I've written so far, that's as much as I can go into the subject. Every now and then this job throws up 'special' cases, where we get up close and personal with ill, dying or dead celebrities. But they are just human being, aren't they? What makes them different is our perspective of them. Nevertheless, it's still a huge testament to this profession that crews dealing with these individuals behave no differently than they would if it was your mother or brother. They might be a bit phased, or if they are a fan, a little shocked and grieved, but the actions are the same; the procedure is professional. Amy Winehouse had a family and friends, just like everyone else. Forget who she was and what she achieved; she'd dead and her family will be grieving about it, just like any normal family. The Press will help to make her death a publicity vehicle but her nearest and dearest will not be interested in the hype. They, like the relatives of any other dead person we encounter, will want to remember her as the person they knew, and we couldn't imagine. Her version of Valerie was played at my wedding, as part of the list of songs we specially requested. I was never a great fan of everything she did, but she was an extremely talented and unique singer. So I hope her family and friends are given the peace they deserve. 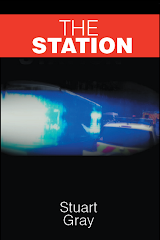 The Station - out very soon! Yeah, yeah... self-promotion but I have no choice. The novel is finished and it's just going through it's 'growing pains'; editing, review and pre-publishing... which will take a month I think. 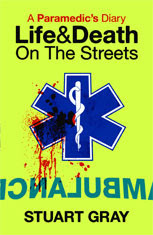 Still, it should be an e-book sometime in August, and available for you to download on Amazon and other online places. I agree with those of you that love a proper book, I do myself - but I can't afford to print it yet and getting a publisher is nigh-on impossible in this climate, so I'm self-publishing until it dies because it's rubbish, or it succeeds and a proper publisher pays for it's printing and promotion. I can also look at download sales and consider whether they are strong enough to take a few thousand pound risk and print it myself. It's my first ever novel and I'm proud of myself for finishing it. Whether it's good, great, average or rubbish, isn't as important right now as the fact that I actually finished it! If I never write again, at least I can say I did what a lot of people only talk about, so I'm chuffed. I can't promote or market it hugely because of the costs involved but I can do something else... I can appeal to all my readers (that is, those of you who read what I write because you like what I write and want to read it) to download it and promote it if you like it, in other words, get your friends to download it too - don't share it, because that will spell the end of sales for me. And just so you know, this isn't about getting rich because, unless I've written the next Harry Potter and have the same luck, I will only be paid something like 30 to 50p a book - that's all author's get once the wolves have had their share. It would be nice to get paid back for the years I put in writing it though. But only get your friends and family to buy it if you truly feel they'd like to read it, that's up to you. But what if everyone who did this spread the word to all of their Facebook and Twitter friends, and they in turn did the same? Wouldn't it become a best-seller overnight? That would be cool and I'd certainly want to write more if it was even moderately successful. 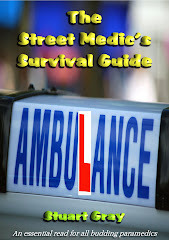 A Paramedic's Diary has done, and is still doing, very well as you know, but this is a work of fiction and so much harder to sell in a forest of other novels. It is also without a big name to promote it, so I have a weak card to play here. Some of you have read the preview... and a few tweaks have been made, but it has become a 38 chapter, 120,000 word story with a beginning, a middle and an end... and a plot, so I hope you will sign up to this! If you are and you think your friends and family will be too, let me know here, or on facebook... or Tweet me (although I don't do much Tweeting myself). I will let you all know how order it soon. I'll put a link here with a little ad for it. Thanks in advance. Let's make it something from nothing! Abbi was with me today; she was experiencing frontline FRU work and the general routine of the ambulance service for the purposes of research. It's always nice when people take an interest I think, don't you? A couple of NPCs started the shift off. There’s nothing quite like running on lights and sirens to a call, just to be writing it up as ‘crew on scene, dealing’ or ‘not required’. It makes the risks much more pertinent I think. Anyhoo, a private taxi driver decided to cut in towards the pavement to park up, without considering an indication or even to look in his mirror at the cyclist who was pedalling along beside him – allegedly. Now, arguably, the cyclist should not have been on the inside (the nearside if you’re a driver) because that is just asking for trouble. Plenty of cyclists die doing that each year. But, equally, the car driver should have looked before he swerved across the poor guy’s path. I found him in a heap on the road, with quite a few people around him as he bled from a very deep gash in his arm. It had been very well dressed by a first aider who’d stopped to help, and the local hotel had supplied a sheet for him for some reason. The sheet, I should point out, became useful later on when I mopped up his blood with it. We can’t have pools of blood in the street, can we? I did go into the hotel and apologise for destroying the item and they were only too happy for me to keep it and dispose of it properly. The cyclist was conscious and alert. He had no other injury, apart from his arm, and the driver of the car, who could have killed him, stood over him as if checking to see that he didn't give an errant version of the truth. He never once asked if the guy was okay. A crew arrived shortly after me and we got the cyclist into the ambulance, where his dressing was removed so that we could examine his injury properly. It was deep; a big chunk of his muscle had been torn out, but the bleeding, which had been described by the first aider as ‘spurting out’, was under control. It was unlikely that an artery had been torn – it was more than likely mistaken identity and a large vein had bled, giving the impression that it was a more important vascular structure. Still, blood is blood and he wasn’t losing any more. We worked out that the cyclist had clipped the car mirror on his way over the bonnet and landed onto the very sharp chain spokes of his bike. It was those tines that had ripped into his arm. If he’d landed on them with his head or neck, we’d be singing from an entirely different hymn sheet. Another cyclist who came off his ride wasn’t hit by anything. His chain has failed, jamming his wheel and catapulting him into the air and over his handlebars. He landed in the road and a couple of passing cops stopped to help him out. When I got on scene, he was sitting with them. He had minor scratches to his elbows and knees. Unlike the last chap, his arm muscles were intact – no chunks missing, so he was lucky. I popped him in the car and took him up to hospital. En-route we discussed PhDs and stuff. As you do. Calls to babies with head injuries are always a worry, but rarely found to be serious. So my next job, which took me to the bank of the river, caused me undue concern. First of all, I couldn’t find anyone to open the barrier that stopped me from gaining access to where I needed to be, so I wasted what could have been precious time tapping on my steering wheel, tutting a lot and using the radio as a means of relaying my frustration. Eventually, a security person came and set me free. Secondly, the mother was walking up to meet me – baby in arms and nothing wrong with it. The little thing had taken a two-foot tumble from her push-chair... onto grass. Mum was worried because her tot ‘wasn’t quite right’ to begin with after the fall. Now, of course, the baby was right as rain. I took them both to A&E for a check anyway because I do understand the concern she felt, although it might have been a little over-cooked..
A 17 year-old fainted apparently. Well, truth be told, she hadn’t fainted. After climbing the stairs and wending my way around a college, I found her lying on the floor of her classroom, with staff members in attendance. They’d described her as having ‘fitted’ and fainted. I could see the girl was conscious a mile away (which is about the distance you have to walk to get from the entrance to the classroom in this place), so I did the ‘eyelash’ thing and she proved herself a liar. This young girl just wanted to get out of there. She didn’t want to communicate with anyone; it’s not that she couldn’t. Once she realised the game was up, she miraculously recovered, sat up and spoke to me in the customary, and necessary-for-effect whispering voice that I can’t hear. 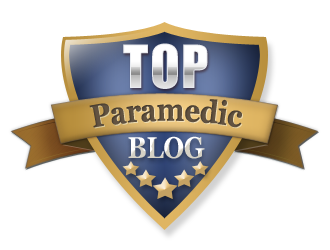 Try not to be upset with me, because I know a few of you think that when I talk like this, I am showing disrespect to patients but I’m not – I’m just emphasising that there are other problems that people have – emotional problems, that do not, and should never, fall under the remit of the emergency ambulance services. Every minute spent with a teenager who just doesn’t like her life, is a minute less available for someone who is really fitting, or who had really fainted... or whose emotional crises is so great that they are suicidal or in need of rescue. ‘I don’t like college and I’d prefer to be somewhere else’ doesn’t qualify. I took her and her friend (they always take their mates with them) to hospital and I taught the teacher the eyelash trick for future reference. At a tube station an 11 year-old tourist fell onto a bit of wood and cut his knee open. It wasn’t a big wound but an ambulance was called regardless. There was a teacher with the child and he was quite prepared to take him to A&E on the bus, but I was already there and I said I’d give them a lift. The underground staff had called 999 for this, which is not like them. They have good first aiders and they know how busy we are. On the way out, with injured child and teacher in tow, we passed his school group and they all waved and wished him well. They gave him worried looks and nodded in his direction. But did they smile at the friendly paramedic... nope. Finally, an urgent call from a MOP who found a man lying in the street ‘unconscious’ with bruises on his head. I pulled up and walked over to the dead man. The tall tourist standing beside him looked like he was in shock. It never occurred to him that if this man on the pavement was in such trouble, how come everybody else was walking past? How come the local people hadn’t taken an interest? The answer my friends, is because he was a known alcoholic - maybe not to the kindly, concerned traveller, but certainly to me and to half of Soho. I woke him up and he moved along, after a short chat about not sleeping in the middle of a busy pavement in broad daylight and scaring the public. He did have bruise on his face, but they were nothing more than fresh street-battle scars. They all have them. ‘I’m so sorry. I didn’t realise. He just wouldn’t move at all for me,’ said the tourist man. ‘That’s okay. It’s not a big deal because I was close by and now we can save an ambulance trip,’ I replied. And that’s the big truth I guess. When I get to wake them up before every alarm bell sounds for nothing, then an ambulance goes somewhere else, where it might actually make a difference. If we could cut out the nonsense calls, the emotional calls, the alcohol-related calls and the hoax calls, we’d have a very excellent ambulance service here. Abbi will take that information back with her. A 40 minute Epistaxis, a concerned first aider and a little office bin full of bloody tissues started the shift off. The 58 year-old had been in a meeting and his nose had started to bleed without warning. 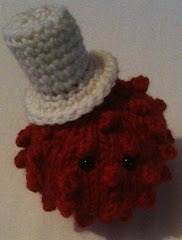 It kept bleeding, despite the valiant efforts of the first aider who'd been summoned to help. The man was taking aspirin every day, so this was not exactly a shock for me. I reassured him, as you do, and checked that he had no sinister medical history I needed to know about, before taking him and his newly-dressed nose ( a dressing is tied tightly around the head and under the nose) to A&E in the car. There was no further drama; the dressing was doing its job. He'd have a good old clot in his nose when they removed it though. A 'pain all over' job for ? Meningitis was nothing of the sort. The 25 year-old Spanish woman, whose 12 year-old daughter acted as my interpreter, had seen her GP the day before and been given cream for a rash on her arms and legs. The rash had cleared up but now she was claiming that she couldn't move and that her neck hurt. The history of a rash, regardless of the fact that it was now gone, the neck pan and 'pain all over' syndrome, meant it would go RED for Meningitis and so I went to the house to check it out. The absence of a headache and photophobia gave me cause to doubt the alarm. She was in her bed, feet elevated for some reason, and her daughter was deeply concerned. It turned out she had no rash (obviously) and that her neck pain was caused by what looked like a Ganglion Cyst on the back of it. As for the 'couldn't move' thing; I gave her the option of walking down to the car with me, or waiting a long time for an ambulance to come. This gave her the inspiration, power and energy to make it to the car. Another minor drama - and one of those calls that make me deeply unhappy about the state of humanity - was to a 38 year-old cleaner who, when dusting around a fluorescent strip light, had an unfortunate meeting with it when it collapsed and slapped her on the head. Now, the thing weighs a few kilos for sure, but she had insisted on an ambulance, even though her only injury was a minor scratch to the forehead. Please, please do NOT harangue me about the possibilities for serious injury etc, with this kind of mishap, because she was fine. Absolutely fine. She needed a gauze swab and a sit-down for a few minutes. She'd had a glancing blow to the head and nothing had been broken - not even the strip light! This is all about ensuring the most is made of a minor event - turn it into a crisis and there may be a few quid at the end of it. That, I'm afraid is all it was about in my humble opinion. The cleaner was working for one of the big name food supermarkets and they are notorious for shelling out when people complain, just to keep bad Press away. You see, the big names have a lot to lose if they get too many injury-associated complaints, so they just pay people off. My advice to them, as if they'd listen, is STOP doing this! You are absolutely encouraging such individuals to make stupid claims. Force people to prove their claims in court! For example, I was involved in a call recently, where an ambulance had been demanded by a customer of one of these stores. She'd slipped on tomato ketchup that was spilled on the floor. Whether it was actually spilled by staff or not is irrelevant, but when she was told that an ambulance would be a while (it was a very busy night), she went crazy and moaned about her aches and pains. I have to tell you that prior to me calling her, she had made no complaint of actual bodily harm. The poor store Manager was very upset because she knew there was nothing wrong with this woman. As my conversation with her progressed, she started to escalate her injuries. Now she had neck pain. Obviously we have no choice but to send an ambulance and she knew this. Not only that but while I was talking to her, another 999 call was made by her sister, who was elsewhere in the store, claiming that staff were causing undue stress to her sibling and making her injuries worse. Now, I'm asking you all, as sensible people here, and I'm making no judgement on this... but does this sound like a planned set-up to you? I took fluorescent strip woman to hospital in the car. En-route, she made several phone calls, each one of which was to a close friend or relative, and each one made her injury sound more than it actually was. And the last call of the shift made me stop and think about all the stuff that had gone before. It was a 'trapped behind locked doors' for an 80 year-old woman who hadn't been seen in two days. She normally answers her phone when her friend calls, like clockwork every weekend, but this time she hadn't. Two days had gone by without a word from her, so her two old friends called the police and we all gathered - her friends, the police and myself - on the balcony, figuring out a way to get in. The door was protected by an iron gate, so the small bedroom window was our only option. I have to say, there didn't seem much hope in this case. I have done a lot of these and when the person hasn't been seen for a while, and they have a very set pattern of behaviour (and they are house-bound), then the chances of finding them alive are slim to nothing. I think her friends knew this. Anyway, we borrowed a chair from a neighbour - they were all out watching this show - and I teetered on it, quite literally, preparing to go through the window when the cops had forced it open. However, there was a delay because the officer in charge of cracking it open with a crow-bar, didn't have the heart to damage it, so the process was slow. 'I don't want to break her window,' he said. 'But if you don't we'll be waiting even longer to get in. She could be in trouble in there,' I suggested. 'It's the poor old lady's life,' I said. This prompted a bit more aggression because this thoughtful cop had clearly forgotten why we were there. Or maybe he thought another few minutes wouldn't make any difference. I don't know. Either way, he meant well. The window burst open and I clambered in. Now, I say clambered and I mean it. I usually get stuffed into windows because I am (usually) the smallest of the bunch in a gang of cops and paramedics, and anyone whose seen me go through a window will tell you I'm no athlete. I was standing on the thinnest ledge imaginable; if I fell backward and they didn't catch me, I would go right over the balcony and drop off the third floor. I had no faith in the ledge or the cops waiting to grab me. I fell into the little room and a tall cop followed me immediately. he just stepped over the ledge with his lanky legs. We went into the flat and I was expecting to see a dead body. I walked into the front room and there, in front of me and sticking out from behind a wall, were a pair of legs. Not moving legs I should add. 'Hello, are you alright?' I shouted. This made the legs move. I was very relieved, as was the police officer standing with me. I went to my patient and she was conscious. She'd been lying in the corner for two days, although she repeatedly told me, and the crew that arrived later on, that she'd only been there since this morning. Her front room was a wreck; it looked like she'd tripped several times and launched herself into the wall, landing in that corner - probably knocked out. I think she'd had a stroke. I had to claim stroke anyway for this lady, just to get an ambulance in good time for her. You see, this is why I get so annoyed with certain people. This poor old woman, who could have died in that corner, had to wait almost an hour until a crew came for her. This was because ambulances were being cancelled on my call and sent to 'higher priority' calls, one of which was a 'headache'. Come on now, that's just not fair. So, I advised Control that I suspected a CVA and that changed the priority. None of this is the fault of our crews or the Control staff; it is the fault of people who think their every little ailment is a major emergency. Or those who will not go and see their GP, or take the trip to A&E themselves. It's time the elderly, vulnerable and genuinely sick of this city (and indeed entire country) got a fairer deal. This, as you know, gets much, much worse at weekends. I watched one episode. I'm not impressed. I'm not sure how Tom Reynolds will be reacting to it either, now that he is no longer in the ambulance service. It could have been something good, a la Green Wing or Scrubs but instead Channel Four apparently see us all as a bit thick and professionally rude. I know it's only fiction but it claims to be based on 'Blood, Sweat and Tea', which is NOT fiction and was well written by Mr. Reynolds... unlike this melodramatic rubbish. And not to be too technical, and based purely on the first episode, Channel Four continually refer to the characters as paramedics but not one of them is - they all wear Emergency Medical Technician epaulette sleeves. You'd think they'd get their research right. As I said, I was looking forward to watching something funny and entertaining. Something that didn't make the profession look stupid. Historically, every single TV or movie based pre-hospital care professional I've seen has been depicted as low-class and subservient to doctors and nurses (in my opinion) and this piece of TV tat does that too. What did Green Wing and Scrubs do right that Sirens didn't? Or are we just no good at being entertaining unless it's real and people are actually suffering? The police and fire service have both benefited, PR-wise, from good, long-running TV exposure, but the ambulance service just doesn't cut it somehow. I wonder why that is? I'm releasing my novel next month. It'll be an e-book to start with. I expect I'll get a fair amount of criticism because writing fiction is hard; it really is. Getting the right balance of irreverence and raw humour and capturing the soul of the characters is daunting for a first-timer like me, but I can imagine the players in my own story acting out a better performance than I've seen with Sirens so far. 'A Paramedic's Diary' is still selling well after 4 years and I'm pleased of course but I've learned something about people out there. There are individuals that read some of what you've written and then submit personal attacks, as if you've just insulted their Granny or something. They don't critique the book; they have a go at the author. Are these the same people who get 'offended' at something on TV and continue to watch it, just so they can be really offended and write in about it? A sad bunch I think. So, to be balanced and fair, I will watch another episode or two and give it my best appraisal. It might improve but I'm doubtful. Tom Reynolds might be pleased with it and if he is, I'm glad, but I don't think I'll be letting any TV luvvies 'interpret' what I've written in quite the same way.